Work is underway to integrate ECF's OSGi 4.2 Remote Services with Spring Dynamic Module so that it's easy to declare your OSGi Remote Services rather than exporting and consuming them programmatically. This work represents an integration and collaboration between the ECF project and the (proposed) Virgo project. org.eclipse.ecf.examples.remoteservices.hello.dm.config.log4j: fragment to configure log4j required by Spring Extender bundle..
org.eclipse.ecf.examples.remoteservices.hello.dm.consumer: bundle of Consumer Hello sample managed with Spring DM. 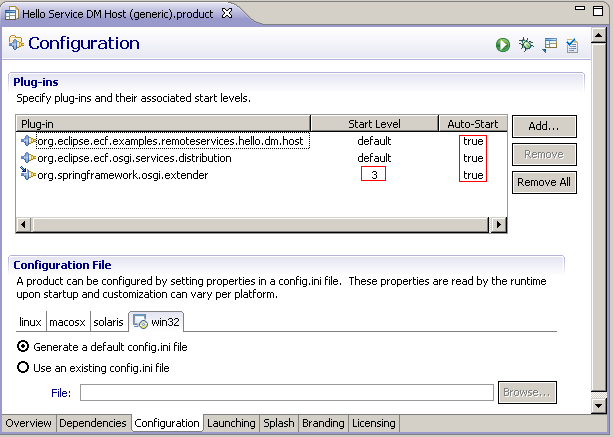 org.eclipse.ecf.examples.remoteservices.hello.dm.host: bundle of Host Hello sample managed with Spring DM. 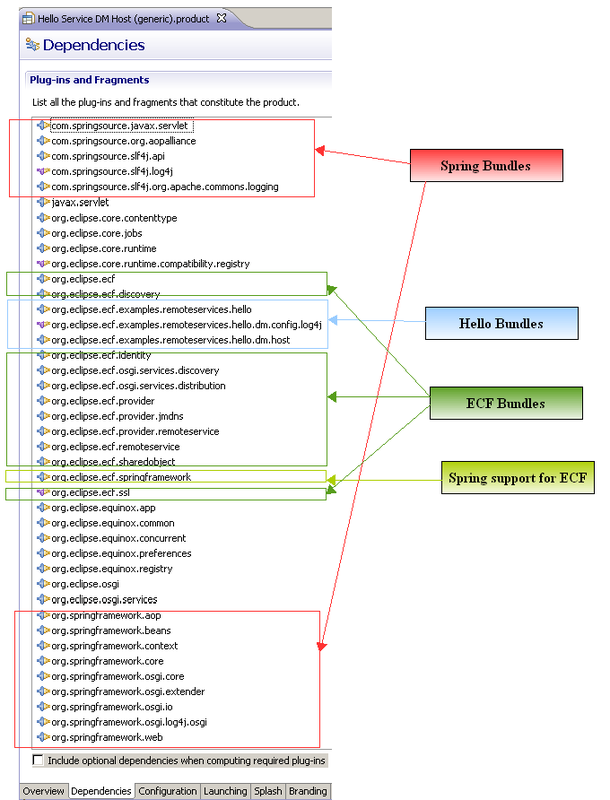 org.eclipse.ecf.springframework : bundle of ECF Spring support. These samples work with ECF 3.2, which is scheduled for release on Feb 19, 2010. If you want test with older version of ECF, use the examples stored into ecf_3.0.0 of the zip that you can find on Bug 302113. There are two roles in OSGi Remote Services: the host (aka the service exporter/publisher), and the consumer (aka the client/service consumer). The host is responsible for exporting/publishing the remote service, and the consumer is responsible for using or consuming the service. Here is a page that describes how to use standard Java code to export (host) and consume (consumer) a simple example service. Another example with Java is given below. To describe what the Spring DM implementation is doing (described below, it's instructive to first describe what happens when OSGi Remote Services are exported programatically...i.e. via Java code. 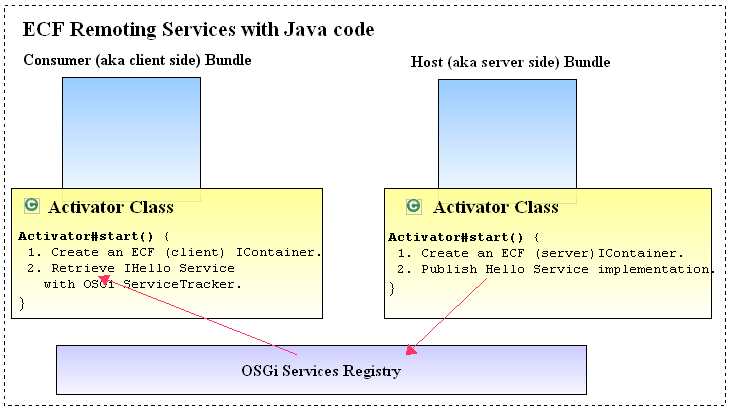 This section briefly shows how to export a remote service via OSGi standard Remote Services, and how to consume that same remote service via the OSGi ServiceTracker. The host bundle creates the ECF IContainer instance(s), and exports/publishes the remote service via a single call to the OSGi BundleContext.registerService method with service properties set as specified by OSGi 4.2 Remote Services standard. According to the Remote Services standard specification, the service properties indicate that the service being registered should be exported. The consumer bundle creates the ECF IContainer instance, and create an OSGi ServiceTracker to track the IHello service. With network-based discovery (i.e. ECF discovery), the ServiceTracker is asynchronously notified when the remote service is discovered. Create an IContainer instance. NOTE: In ECF 3.2's OSGi Remote Service implementation, it is OPTIONAL to do this step...as the IContainer instance will be created lazily by ECF's implementation. // property set (as defined by OSGi 4.2 remote services spec). org.eclipse.ecf.examples.remoteservices.hello.dm.host: host bundle -- which exports the Hello service implementation with ECF IContainer type "ecf.generic.server". org.eclipse.ecf.examples.remoteservices.hello.dm.consumer: consumer bundle -- which creates a Thread HelloClientThread, and calls the service IHello every second by using an ECF IContainer type of "ecf.generic.client". This scheme shows that ECF IContainer creation and exporting and consuming services can be done declaratively with Spring DM. Host and Consumer bundles define a XML Spring file (in this sample module-context.xml is used but you can used any name and it's better to split files for simple bean definition and osgi definition). The Spring bundle Extender load each XML Spring files stored into META-INF/Spring. 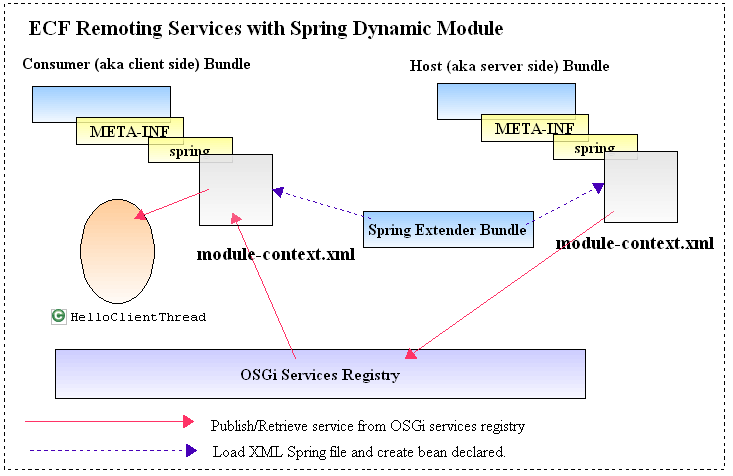 Host bundle define Spring file module-context.xml which exports the services (with ECF 3.2 no need to create the IContainer) by using <osgi:service with classic Spring DM. Consumer bundle define Spring file module-context.xml which create the ECF Container by using ECF Spring support and consume the service by using <osgi:reference with classic Spring DM. IHello service called with HelloClientThread (Spring DM). In ECF 3.2's OSGi Remote Service implementation, this declaration is NOT required/optional as described above. The ECF implementation will lazily create the "ecf.generic.server" instance lazily. Note you have cardinality="0..1" defined into <osgi:reference. this attribute is very important. Indead by default cardinality="1..1" and it means that the service MUST be retrieved. When you start the consumer bundle the service can be retrieved the first time and if you set not the cardinality to "0..1", the bean HelloClientThread which use this service can be NOT created. creation of ECF IContainer by using Spring factory bean HostContainerFactoryBean and ConsumerContainerFactoryBean. creation of ECF IConnectContext by using Spring factory bean ConnectContextFactoryBean. NOTE: This project is currently in incubation, and so is not distributed as part of ECF's upcoming 3.2 release (Feb 19, 2010). We expect to include this work in our Helios/3.3 release, however. NOTE: The ECF project is working with the propose Virgo project, to provide integration between ECF's support for OSGi 4.2 Remote Services and Virgo. The work described on this page will very likely be done in concert with the Virgo team. HostContainerFactoryBean is Spring factory bean to create an ECF IContainer on server side. Here the XML bean declaration to create an ECF IContainer with type "ecf.generic.server"
ConsumerContainerFactoryBean is Spring factory bean to create an ECF IContainer on client side. Here the XML bean declaration to create an ECF IContainer with type "ecf.generic.client"
You can too set the IContainerFactory or the IContainerManager retrieved by OSGi services registry like HostContainerFactoryBean . Exist but NOT tested. TODO: create another IDFactoryBean. ConnectContextFactoryBean is Spring factory bean to create an ECF IConnectContext. Launch (Eclipse Application or OSGi Framework) is used to start your Host and Consumer Bundle. With launch, you can configre the bundles that you want start and configure it (start-level, auto-start...). Into DM example you have products (wgich generate launch) that you can use to start Host/Consumer bundles. configure several bundles to auto-start to true. SCOT COULD YOU EXPLAIN EACH BUNDLE OF ECF (discovery, ssl....)??? org.eclipse.ecf.examples.remoteservices.hello.dm.host which is the bundle which publish/export the implementation of the services. org.eclipse.ecf.osgi.services.distribution : SCOTT COULD YOU EXPLAIN THE GOAL OF THIS BUNDLE PLEASE??? THANK A LOT. org.springframework.osgi.extender which is the Spring Extender Bundle which detect for each bundles if it contains XML Spring files and load it. It's adwice to start this bunlde before others bundles. To manage that you can for instance set the start-level to 3. This page was last modified 06:59, 13 February 2010 by Angelo. Based on work by Scott Lewis.